In this updated version of Magnum P.I. 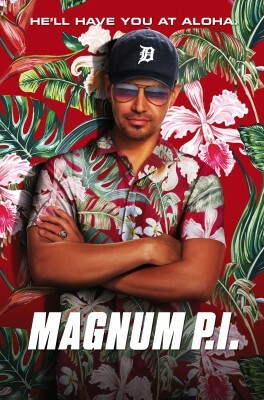 Thomas Magnum (played by Jay Hernandez), a decorated former Navy Seal who is trying to get his P.I. business off the ground in the tropical surroundings of Oahu, Hawaii. Magnum has returned from Afghanistan and is now living in a guest cottage at Robin’s Nest, where he serves as a security consultant to the absent owner. The estate’s majordomo is the beautiful ex-MI-6 agent, Juliet Higgins,(played by Perdita Weeks). She and her two trained Dobermans try to keep Magnum in line and out of trouble, which proves to be a hard task. With the help of Higgins and his two Marine friends, TC (played by Stephen Hill) and Rick (played by Zachary Knighton), who shared a POW cell with him, Magnum tries to help get justice for the weak and needy, but not for much, if any, money. TC’s talent is flying choppers and he owns Island Hoppers, a helicopter tour business. Rick is the most connected man on the island who can find or get you anything you want, while running his nightclub business. From a stolen tuna fish to a woman in a coma with massive facial reconstruction, Oahu’s bad guys don’t stand a chance when the four of them take on a case. This modernized version of Magnum is terrific! The cast and storylines carry on the story from the original Magnum with updated twists like cell phones and computers. The fast cars, beautiful women, and breathtaking scenery are all there. The friendship between the three men comes across as realistic. The biggest change is that Higgins is now a woman who has some serious survival skills. If you enjoy an action and adventure show with hot cars, hotter women, and unbreakable loyalty between the main characters, this is a show for you! You can learn more on the show’s website. Thx for the review, Doward. Sounds like a good show.